L Brands’ (LB) Bath & Body Works has performed well recently, but its Victoria’s Secret brands have dragged the company down. 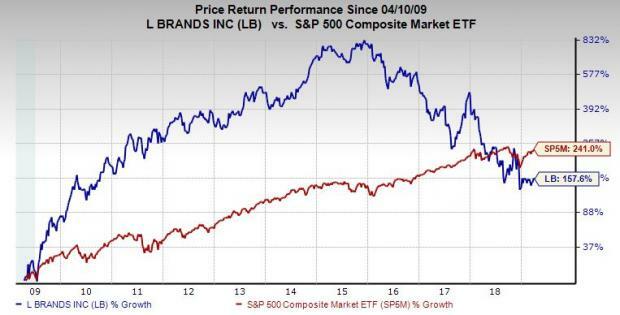 Shares of LB have fallen 28% in the last 12 months as part of a much larger three-year decline as shopping habits and consumer sentiment evolve. As we mentioned at the top, L Brands owns Victoria’s Secret, Victoria’s Secret PINK, and Bath & Body Works. The company’s operations include nearly 3,000 company-owned stores throughout the U.S., Canada, the U.K., China, and more. L Brands also operates roughly 650 franchised locations and, like every other retailer, has tried to expand its e-commerce business. Overall, L Brands’ revenue has continued to climb in the midst of the rough stretch. But the disappointment at Victoria’s Secret has led to increased worries that include CEO turnover and calls to break up the business. The lingerie unit’s former CEO Jan Singer resigned last fall after just two years with the company. Since then, New York-based hedge fund Barington Capital Group LP has urged the company to split its growing Bath & Body Works business from the faltering Victoria’s Secret. This would move would be similar to Gap’s (GPS) recent choice to sperate Old Navy. Barington pointed out in a letter that the company was far too slow to enter the booming athleisure market, which Nike (NKE), Adidas (ADDYY), and Lululemon (LULU) have all taken advantage of. The firm did praise the company’s decision to re-enter swimwear—after it abandoned its seemingly popular swimwear and apparel categories in 2016—as the likes of Target (TGT) attract consumers to its growing fashion portfolio. Victoria’s Secret also faces competition from up-and-coming brands ThirdLove and American Eagle (AEO)-owned Aerie. With that said, Victoria’s Secret saw its fourth-quarter comparable store sales slip 3%, with in-store sales down 7%. Meanwhile, Bath & Body Works comps jumped 12% to help overall Q4 comps pop 3%. Investors still interested in the broader Retail-Apparel and Shoes industry might instead turn to Abercrombie & Fitch (ANF), Canada Goose (GOOS), Kering SA (PPRUY), and Nordstrom, Inc. (JWN), which are all either Zacks Rank #1 (Strong Buy) or #2 (Buy) stocks right now.